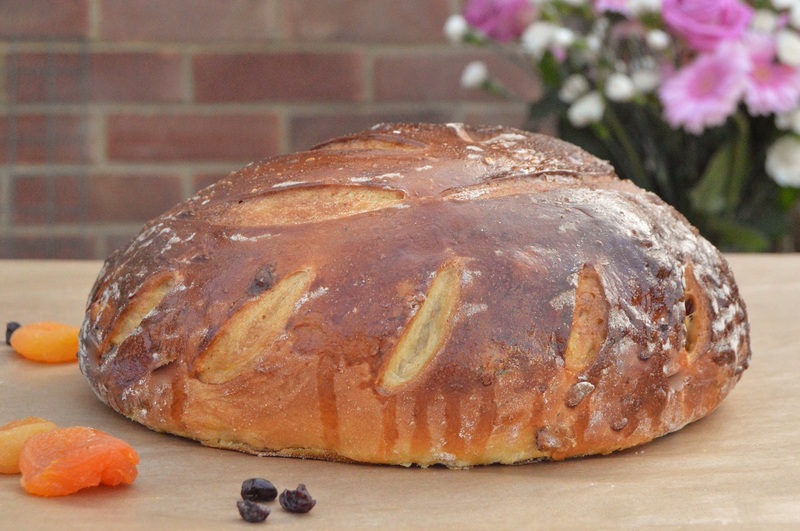 This is my spiced fruit version of a brioche: rich, well spiced with a buttery, citrussy flavour;tiny bursts of orange-soaked cranberries, apricots and raisins add sharp sweetness to the brioche. 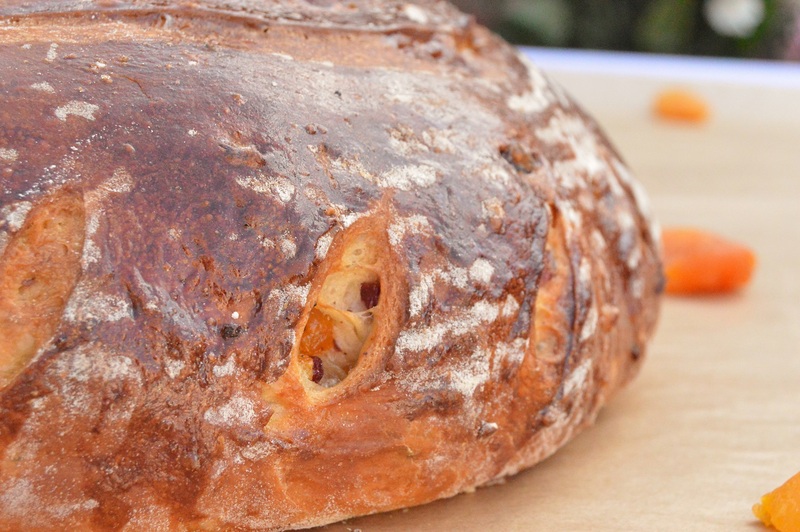 This loaf is easy to make and, as with most breads, time is needed for it to rise: and it will be a very slow rise here because of the butter and egg content in the dough. This brioche is perfect sliced, toasted and buttered: and salted butter is the best here! This is my adaptation of a brioche dough I have been using for decades. This rich, buttery dough has mixed spice, cinnamon and orange juice which work so well together here. I soak the dried fruit in orange juice, so that they are as plump and as squidgy as they can be but you can just used them straight from the packet. 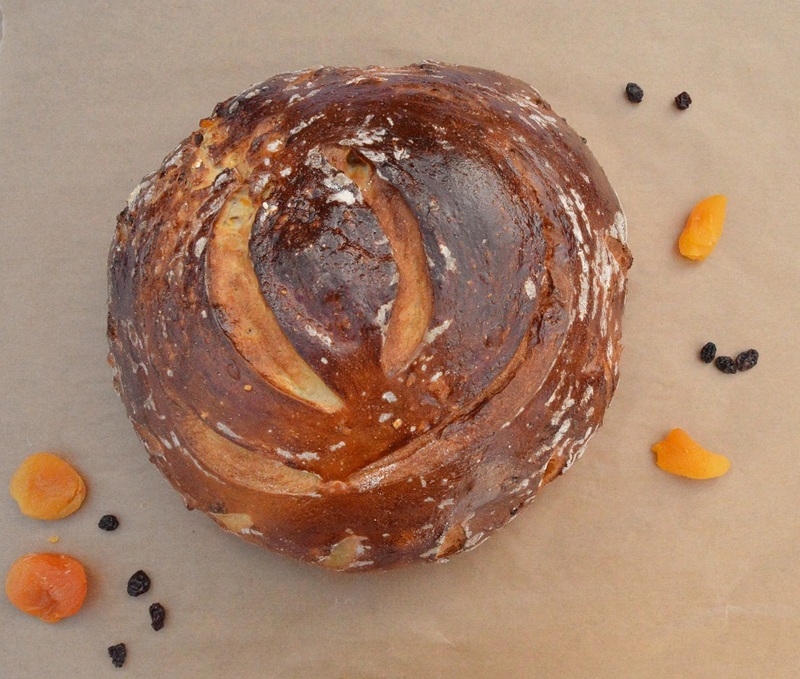 I have not packed this bread with fruits as I wanted the richness of the dough to shine. 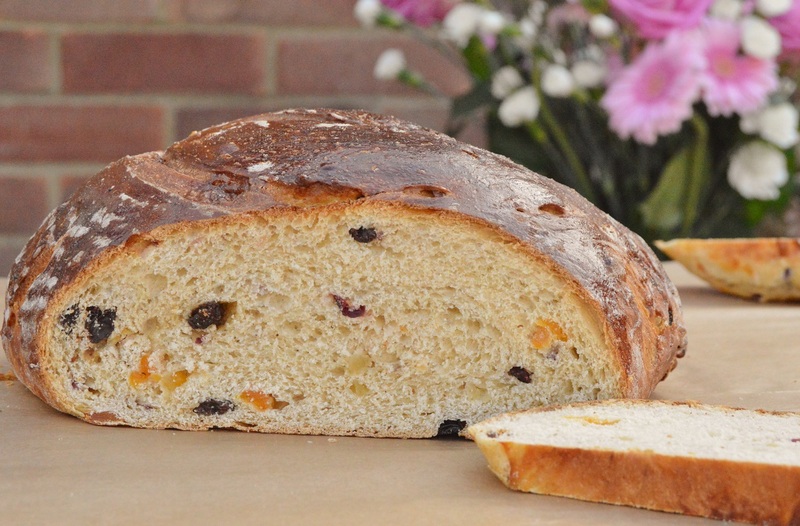 You can add more to the dough, and can use any variety of dried fruit, but I would limit the amount to no more than 150g in order to keep the lightness of the brioche. The dough is quite sticky to begin with and kneading it in a food mixer with the dough hook makes this so easy. The dough is then allowed to rise slowly, including time in the fridge to firm up, before adding the dried fruit, shaping it and then popping it into a tin or boule to rise before baking. As a great alternative, use chopped dark chocolate and chopped dried cherries (ideally soaked overnight in a liqueur of choice!). I love using bannetons for most breads, especially for the ridge effect you get but you can make this in either loaf tins or deep circular sandwich tins. For a nice visual, split the dough into pieces, roll them into balls and drop them into the tin: they will rise into each other but give natural bumps along the surface. These can also be baked as small rolls, in which case bake them for 15-20 minutes. 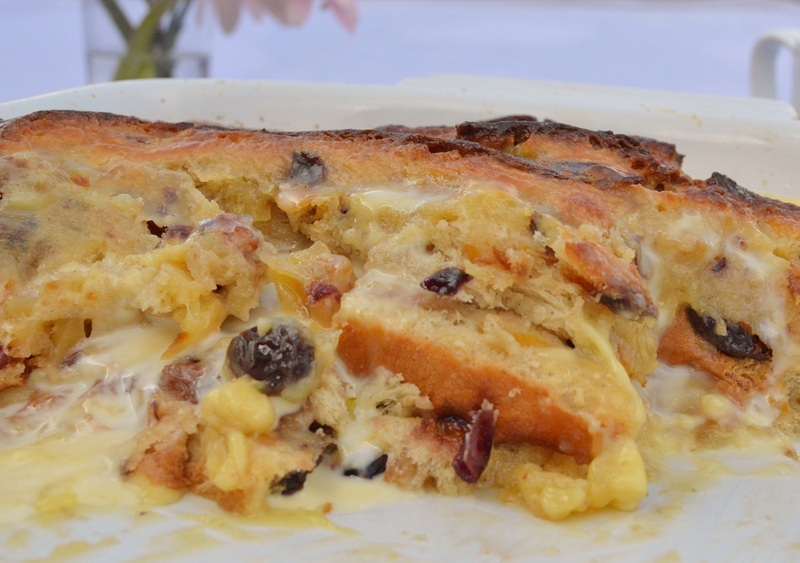 If you have any of this brioche left over, it makes a terrific version of a bread and butter pudding: one of my favourites is to use a lemongrass custard. I will post the recipe for this lemongrass pudding shortly. (1) Mix the flour, salt, sugar, orange zest, yeast and the spices together in a large bowl. Add the eggs, egg yolks, vanilla and the milk to form a soft dough. Knead for a 7 minutes on a low-medium setting using the dough hook attachment. (2) Add the butter, a bit at a time, with the machine still going until the butter has been incorporated into the dough. Knead well about 10-15 minutes until it becomes elastic and smooth, having it on the medium setting. (3) Cover with clingfilm and leave to rise at room temperature until almost doubled in size – this will take a long time because of the butter and eggs in the dough. When the dough has well risen, pop it in the fridge to firm up overnight: this not only makes the dough much easier to handle, it gives a much better flavour owing to the slowing down of the yeast. (4) Meanwhile, heat the dried fruit together in a small pan with the orange juice until the juice just comes to the simmering point. Remove from the heat, cover and leave overnight to soak up the juice and plump up. (5) Turn the dough onto a lightly floured board and with lightly floured hands gently work in the fruit, kneading lightly until the dough is smooth. NB: if the dough feels too warm or at all sticky, cover in clingfilm and chill for about 30 minutes. (6) Place in a well floured banneton or a well buttered large loaf tin and either cover with clingfilm or pop inside a large plastic bag or bin liner. (7) Leave at room temperature or a slightly warm place for a couple of hours until well risen. Meanwhile, preheat the oven to 180C(fan). (8) If using a banneton, turn the dough onto a baking sheet lined with a double layer greaseproof. Brush all over with the beaten egg and score with a sharp knife or razor. Bake for 15 minutes at 180C (fan) and then turn down the oven to 160C (fan) for a further 25-30 minutes until the brioche is a deep golden colour, covering with foil or greaseproof if it is looking too dark. Thank you: yes, it tastes almost hot cross bun-like. Next Next post: The easiest & quickest smoked mackerel pâté in the world!